Canadian Antique : THE 1873 BENNETT’S SYROP JUG : FROM PENNSYLVANIA TO BALTIMORE. THE 1873 BENNETT’S SYROP JUG : FROM PENNSYLVANIA TO BALTIMORE. In this note, we solve the mystery of the white ware (ironstone) syrop jug which bears under its base the stamped mark “ BENNETT’S PATENT, jan 28 1873 ”. We take this opportunity to dispel some inaccuracies about the Bennett family activities. Several molasses or syrop jugs bearing the stamped mark “BENNETT’S PATENT, jan 28 1873” are known to exist, generally attributed to the famed Baltimore Queensware Pottery of Edwin Bennett. However, this patent was not issued to Edwin Bennett, although many take it for granted, but to Mark J. Bennett, of Braddocks, Allegheny County, Pennsylvania. What was the patent about and what was the relationship, if any, between Mark and Edwin Bennett? Syrop jug with pewter top, white ware of the ironstone variety with hand-colored flowers and gold bands and the stamped mark on the bottom. H. 18 cm. A similar undecorated syrop jug with the same mark is shown and discussed in the recent book on Philip Pointon, a master potter in Baltimore and elsewhere (Beaudry Dion & Dion, 2013, p. 102). Photo Jacqueline B. Dion. Daniel (1815- April 6, 1892) had arrived to the USA with his wife Catherine Bates, his son Mark J. and daughter Ely. (Cushing, 1889, p. 499 and p. 574). Mark J., aged 21 at the 1860 US census, was thus born c.1839. At the 1870 census, Mark J.’s occupation is described as Glass Manufacturer. Effectively, by 1869, William and Daniel stopped manufacturing pottery and became involved, with Mark J., with the Crystal Glass Co (1870-1888), located nearby in Pittsburg, (Southside). An advertisement of 1870, given in Hawkins, (2009, p. 142), indicates Daniel Bennett as President of the Crystal Glass Co., William Bennett as secretary and treasurer, Mark J. Bennett as Business Agent and John Henderson as factory Sup’t. 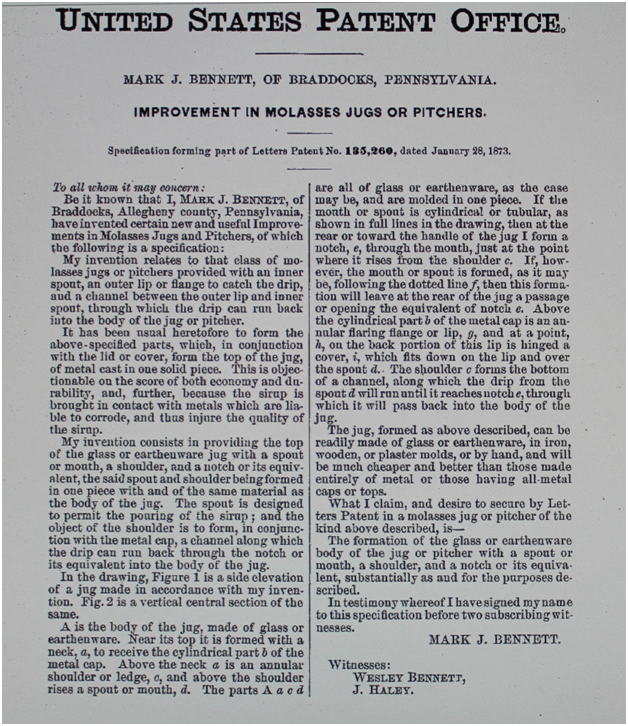 Clearly Mark’s motivation for the patent was to have the production of glass syrop jugs at the Crystal Glass Co., but it could be used also, as stated in the letters patent, for earthenware containers. Meanwhile, Edwin Bennett (1818-June 13,1908) moved to Baltimore; he erected a pottery at that place in 1847 (not in 1846 as inferred by Barber on p. 195, and repeated by Spargo, p. 224, Ramsay, p. 164 and many others). We take this opportunity to establish firmly that fact. The following two extracts from Newspapers of 1847 are self-explanatory. White ware was introduced in 1868 (not 1869 as stated by Barber, p. 195 and others) at the Edwin Bennett Queensware Pottery. Philip Pointon, who was then Superintendent at the Queensware Pottery, did produce, already in August 1868, white granite as well as cream color ware (see Beaudry Dion & Dion, 2013, p. 42). Both Bennett and Pointon are recorded in the alphabetical section of the Woods’ Baltimore City Directory for 1868-69, published in Nov. 1868. 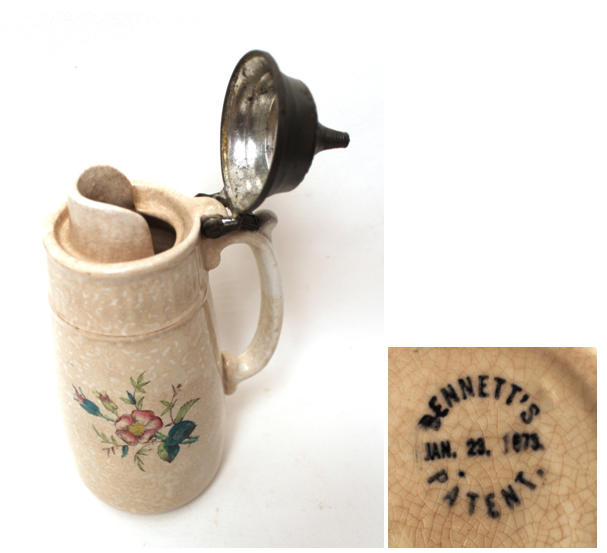 At the time of the patent for the Bennett’s syrop jug, Edwin Bennett was the only member of the family still involved with pottery, notably white ware, plain and decorated. It is more than likely that he is the one responsible for the production of the earthenware jug pictured here, using freely his nephew’s patent. The exhibition The Potter’s Craft in Maryland held in Baltimore from March to May 1955, presented a white ware syrop jug with pewter top, marked Bennett’s Patent 1886 [1873? 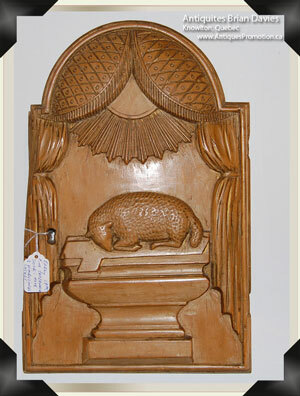 ], lent by Mr. and Mrs. Edwin Bennett Filbert (exhibit no 54 in the 1955 catalogue of the Maryland Historical Society). The exhibition also contained a copy of the resolution of the Mayor and Council of Baltimore, dated May 20, 1847, granting Edwin Bennett permission to erect a queensware factory at the corner of Caton [Canton] Avenue and Canal Street. [In fact, this resolution was amended and passed already on May 13, 1847, according to The Sun, May 14, 1847, p. 4]. Despite that information, the catalogue repeats the date of 1846 for the erection of the pottery in Baltimore. 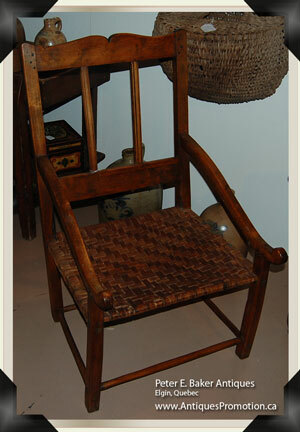 This Pottery had a long and fruitful life, as did its founder and owner. Edwin Bennett, born March 6, 1818, was said to be the oldest potter alive in America before he died on June 13, 1908, being 90 years old. (Trenton Evening Times, June 16, 1908). In conclusion, the stamped mark Bennett’s Patent jan 28 1873 on the syrop jug does refer to letters patent issued to Mark J. Bennett, of Braddocks, Pennsylvania. Mark was only involved, at that time, with glass ware, not pottery. The white ware syrop jug itself was most likely produced at the Baltimore Queensware Pottery of his uncle Edwin Bennett, sometimes after that date. One such syrop jug was reportedly offered to Wallace Nutting as a wedding gift on Oct. 28, 1884 (The Palm Beach Post, West Palm Beach, Florida, March 25, 2001). Signatures of Mark J. Bennett, 1873 and of Edwin Bennett, 1874, both from USPO documents. BARBER, EDWIN ATLEE. The Pottery and Porcelain of the United States, N.Y. & London, The Knickerbokers Press, 1893, 446 p.
BARTH, Harrold B. History of Columbiana County, Ohio, Topeka and Indianapolis, Historical Publication Co. 1926. CUSHING,Thomas. The History of Allegheny County, Pennsylvania. Chicago, A. Warner & Co, 1889. GOLDBERG, Arthur F. “Highlights in the Development of the Rockingham and Yellow ware Industry in the United States- A Brief Review with Representative Examples”, Ceramics in America 2003, (Robert Hunter, ed. 321 p.) Milwaukee, WI, Chipstone Foundation, 2003, p. 26-46. HAWKINS, JAY W. Glasshouses and Glass Manufacturers of the Pittsburgh Region: 1795-1910. iUniverse Publ., 2009, 612 p.
JERVIS, W. P. The Encyclopedia of Ceramics, New York, W. P. Jervis, 1902, 673 p.
[MARYLAND HISTORICAL SOCIETY]. The Potter’s Craft in Maryland / An Exhibition of Nearly 200 Examples of Pottery Manufactured 1793 to 1890, Baltimore, Maryland, The Maryland Historical Society, 1955. MYERS, Susan H. “Aesthetic Aspirations : Baltimore Potters and the Art Craze”, American Ceramic Circle Journal, Vol. VIII, NY, The American Ceramic Circle, 1992, p 25-54. RAMSAY, John. American Potters and Pottery. Clinton, Massachusset, Colonial Press Inc., 1939, 304 p.
REVI, ALBERT CHRISTIAN. American Pressed Glass and Figure Bottles. Nelson, New York, 1964, third printing 1970. 446 p.
SPARGO, John. Early American Pottery and China, NY & London, The Century Co., 1926, xviii + 393 p.
The second annual Old Montreal Antiques Show once again brought together a host of high quality antique dealers from across Quebec and Ontario. The show was full of atmosphere with the string quartet playing and the champagne and wine flowing. 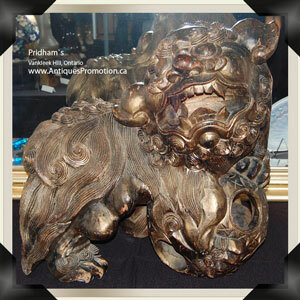 For your enjoyment, Antiques Promotion Canada presents some of the dealers favourite and most expensive pieces from the show. Just for fun, we challenge you to guess the correct price. Hold your mouse over the 'See the Price' button to see how close you are! 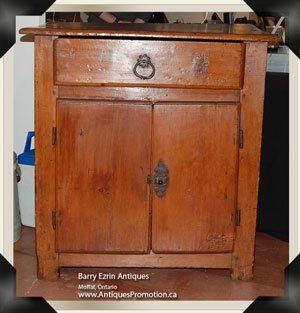 Quebec Lion footed cabinet displayed by the show promoter Stephan Gagnon. 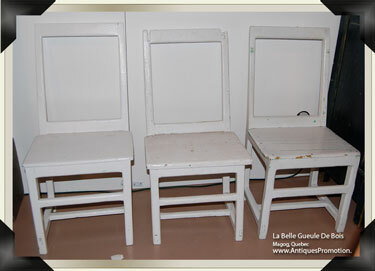 Set of 6, Quebec Ile d'Orleans 19th Century Chairs. 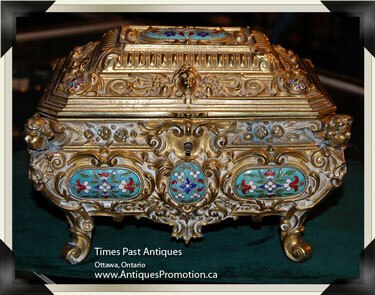 Russian Imperial Gilt Bronze Box with Enamel Plaques, circa 1870-80. 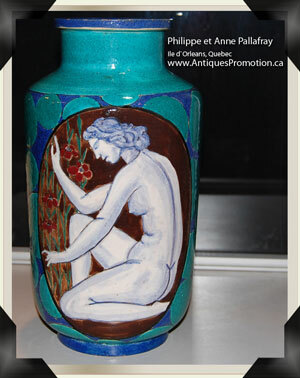 French Art Deco ceramic vase by Rene Buthaud (1886-1986). Art Deco Sterling Silver knife stand set, with fishing and hunting scenes. 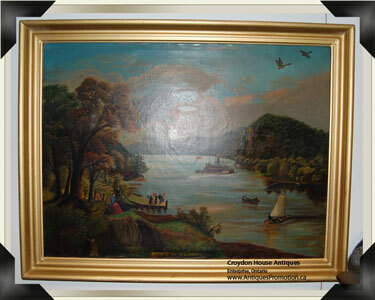 "Sunset on the St. Lawrence" painting. 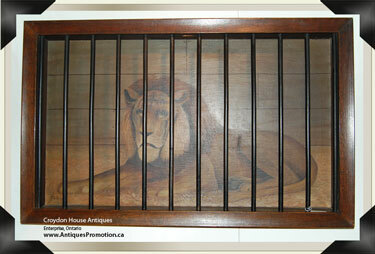 Canadian Folk Art "Lion in Cage" painting, circa 1930. Bronze bust by Marc-Aurele de Foy Suzor-Cote (1869-1937) "Pierre Martin". Rosewood Chinese Foo Dog, with carved ball in mouth and between feet, c.1850. 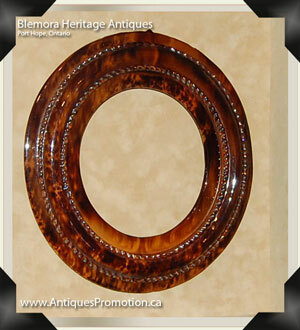 Glazed redware pottery picture frame from Ahrens Pottery, Ontario, late 19th Century. 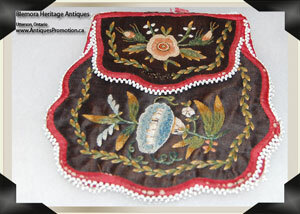 Iroquois glass beaded purse on moose hair, early 19th Century. 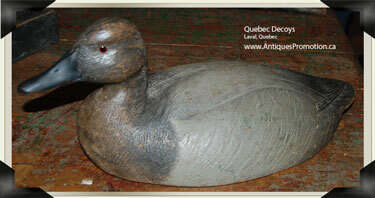 Common Golden Eye female Decoy by Orel Le Boeuf, St. Anicet, Qc, circa 1950. Quebecois Adam Armoire, decorated with flowers and foliage, from the region of Joliette, circa 1790-1810. Quebec Louis XV corner cabinet with shell detail and design along base, circa 1780-1800. 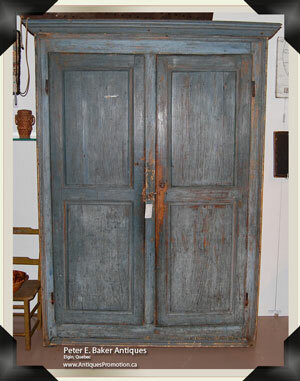 Quebec, Louis XVIII armoire with beautiful blue colour. Quebec, Louis XIII armchair, with arched legs and reversed arms. 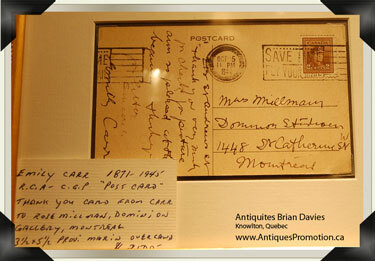 Thank you postcard from Emily Carr (1871-1945) to Rose Millman, Dominion Gallery, Montreal. 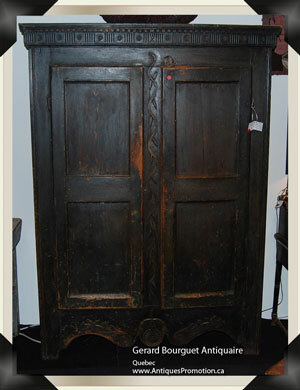 Quebec 19th Century pine tabernacle door. 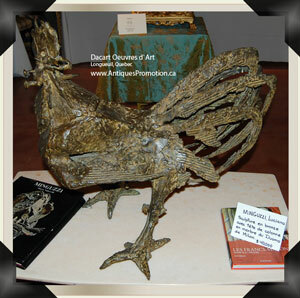 Stunning Bronze sculpture of cockerel by Luciano Minguzzi. 17th Century Pharmaceutical apothecary, made in Rouen. More pieces of interest or expense! 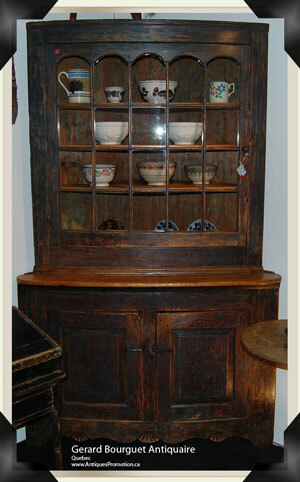 A wonderful 18th Century Buffet with "Chapeau Gendarme" panels and rare St. Andrews Cross detail. 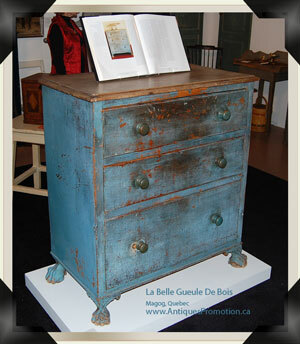 Low pine Buffet or Commode, owned by Sister St. Madeline, L'Hopital General de Quebec, c.1690. 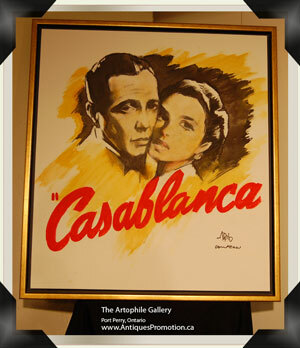 Original canvas poster artwork for 'Casablanca'. 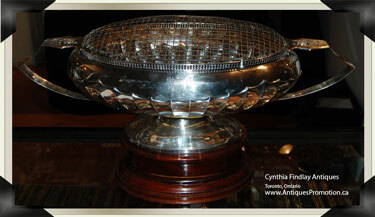 Sterling silver presentation centerpiece, given as a gift from Louis Alexandre Tashereau (Premier of Quebec 1920-1936) to his nephew (Mr. R. A. Benoit) in 1929. 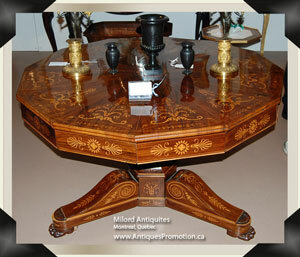 A stunning Charles X period rosewood twelve sided center table, with inlaid boxwood attributes on a tripod pedestal with lion paws feet, circa 1825. 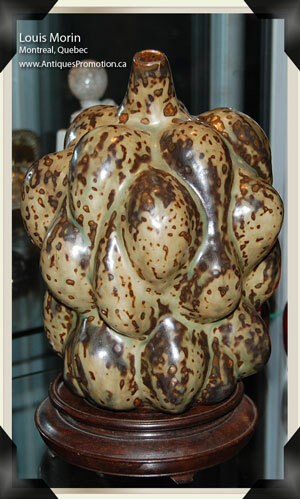 A fantastic piece of Scandinavian art pottery, depicting a bunch of grapes. 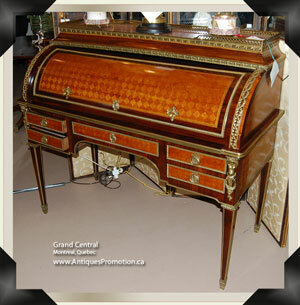 A French Louis XVI style hidden desk with intricate inlaid wood and bronze detailing, circa 1850. The Magic Question ... How Much is it Worth? It's always tricky to answer that question precisely as price may vary over time. It is important to understand that two identical items might sell for very different prices depending on; who the seller is, where the object is sold, the timing, the provenance, etc. Even though, it's is reasonable to believe that past prices will make a great prediction on average, of future prices. Simply saying you have a jar makes it nearly impossible to know how much it's worth. It helps to say that it's a pottery cookie jar, but there is still a lot of information missing. By adding a picture there is a much better sense of the item but if there are no visible marks to help identify the model or manufacturer, an objective evaluation still cannot be made. The secret to properly identifying a vintage or antique item is to gather as much information as possible and use multiple resources to definitively identify the item and determine its value. 1. 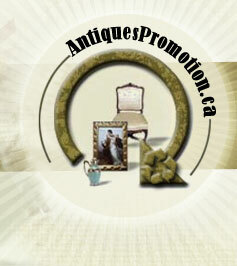 Use the appropriate Antiques Promotion Canada forum to ask questions and post photos. Someone in the community – a dealer or another collector, may be able to provide information about your object (the style, the maker, its age, etc.). In fact, had you posted a picture of this cookie jar, we’re confident you would already have your answer that it is a Little Chef cookie jar by Shawnee Pottery. 2. Reference Books are one of the best ways to find complete information about an object. There are general books like “Kovel's Antiques & Collectibles Price Guide” and “Schroeder's Antiques Price Guide,” although this has few photos but lists lots of objects. 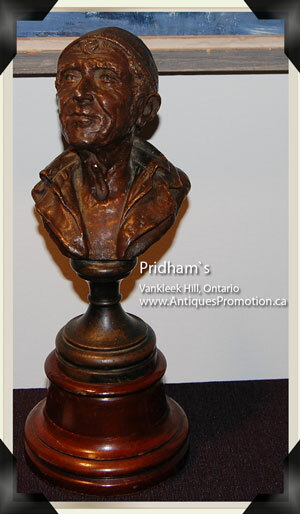 For beginners, we recommend more illustrated price guides such as “Millers Antiques Price Guide” (lots of colour pictures) or even better for Canadians, “The Unitt's Canadian Price Guides” with black and white photos from antique shops all over Canada. There are also books on all kinds of specialized subjects. If you have multiple objects in the same category, it would be wise to invest in such a book. You can find these books at shows from specialized dealers, on eBay , AbeBooks or Amazon.ca. Please see our book review section for links to books with Canadian connections. Books with no pictures will discuss Shawnee Pottery and probably list a “Little Chef” cookie jar, but based on the little information in our example, it is unlikely you would find it. On the other hand, specialized books on cookie jars would be the best way to identify your cookie jar, as they are most likely to have a picture of it. 3. Researching on the Internet can produce extraordinary results or be very disappointing. Good luck! In general, information presented can be incomplete and/or very hard to find. We recommend you use Google but you need to have some idea what you are looking for. Sometimes a Google Image search can provide great results. We also recommend trying an eBay search, which is one of the easiest and best free search tools available. 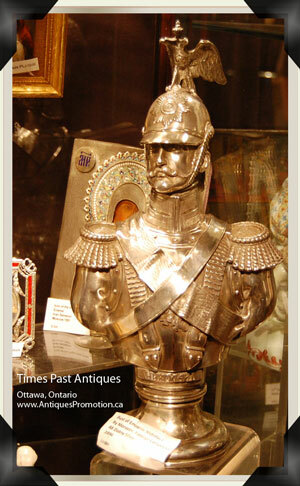 Yet another resource is LiveAuctioneers.com, also free and easy to find more expensive antiques auction results. When you have an accurate description of your object, finding its value is relatively simple. 1. For small objects that are relatively common, which is more than 99.5% of items, eBay is generally a great solution. Completed items from the past two weeks often provide a reasonable evaluation. In our example, there were three Shawnee “Little Chef” cookie jars that sold on eBay but only one is identical with the same colour. It sold for $55. It's possible that during another week, an identical cookie jar will sell for more or less than $55 but it gives us a good idea of its commercial potential. 2. 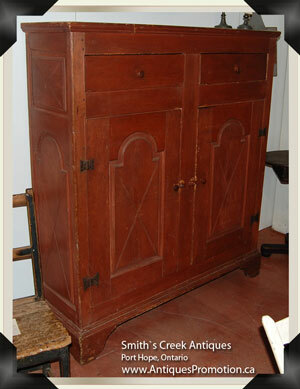 For small but very rare objects, auction results are often needed. You can order specialized auction catalogues on AbeBooks or on eBay. 3. For furniture, books with value guides are generally reliable although the suggested values are sometimes too high. Rely on your market experience to adjust the suggested prices to something more realistic. If you have little or no experience, we suggest going to a local auction to see how much similar items sell for. Online classifieds are also a good source of information, though not necessarily a good indicator of price.